An accident may occur in a split second. As surveyors, we see the effects of various accidents on daily basis. This includes not only material damage, but sadly also incidents in which people get injured. Hence, we take safety and working safely serious. Our surveyors perform their work mostly on the premises of others. On all premises, ships and terminals different types of dangers may be encountered and, therefore, different safety regulations may be applicable. We always ensure that we are fully aware of all dangers and that may be encountered and that our work is performed in strict accordance with the safety regulations. Before we attend on board of a ship or at a terminal we report at the supervising authority. On board a ship we report at the ships staff. We sign out when leaving again. If we observe an unsafe situation, we report this to the supervisor. Before we enter enclosed spaces, we ensure that it is safe to enter and that the safe for man certificate is valid throughout the period of time the inspection must be held. 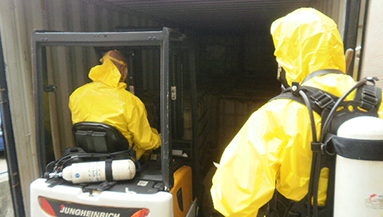 When entering tank containers and cargo tanks, we always require a second man stand-by at the access hatch. On the basis of our knowledge and experience we are alert on danger that our profession brings with itself. Our surveyors hold the Basic Elements of Safety Certificate and they followed a course into fire extinguishing. We work in accordance with the applicable regulations and use the appropriate personal protection aids, if necessary. All procedures with regard to health and safety are registered in quality manuals. We follow courses regularly in order to keep our knowledge up-to-date.